The problem of the "lonely non-voter": A new study finds those who have just lost a spouse are less likely to cast a ballot -- though the reasons are unclear. Does loneliness make people less politically active? For decades, social scientists have questioned the relationship between social isolation and political participation, but it's difficult to quantify. 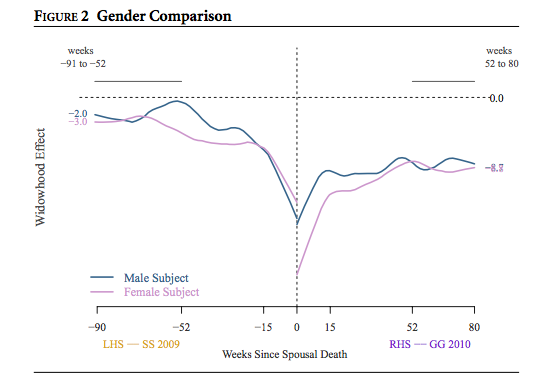 A new article in the American Journal of Political Science does so by looking at how the death of a spouse affects voting behavior over time. Using census data, voting records, and information from the ominously named Social Security Death Master File, they measured the voting habits of 5.86 million Californians before and after the 2009-2010 statewide elections. What they found is that widows and widowers were much less likely to vote after their significant other died. Based on their predictions, 11 percent of people who would have voted if their spouse were alive failed to make it to the polls even a year and a half after the death. Even though research has shown that men are hit harder by the death of a spouse than women, widows saw a greater drop-off in their turnout rate than widowers. The graph below shows the the difference in turnout between men and women, but it also shows overall voting patterns. Right after their spouse dies, people are much less likely to vote. After some time passes, the turnout rate stabilizes at a lower level. 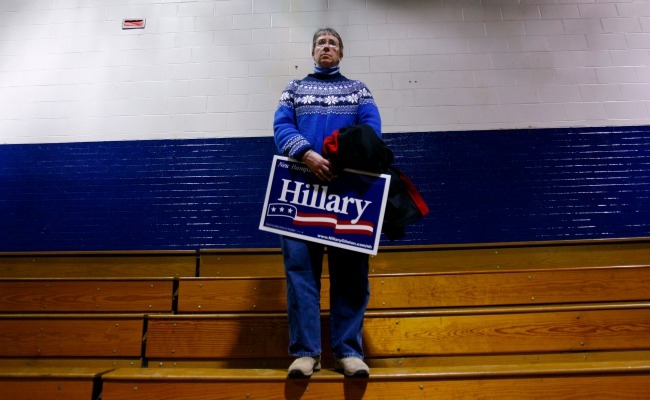 What causes this problem of the "lonely non-voter," as the authors call it? They don't speculate much, but they do offer a few potential explanations. For one thing, nagging helps. Previous research has found that people are more likely to vote when prodded by someone they know, and that someone is most likely to be a spouse. There's also an argument to be made for Crossfire-style dinner-table discussions: Casual conversations about politics among husbands and wives drive up both peoples' interest in political affairs, social scientists speculate. The more obvious explanation is simpler: Grief prevents people from doing things they otherwise might. The authors acknowledge that a spouse's death might affect other areas of someone's life, including health, emotional stability, and social life. People might have bigger things to think about than politics on Election Day. But obvious as it might be, that's also a provocative idea: People's emotional lives have a big effect on the way they participate in politics. What's unclear is how private sadness gets translated to public life. Does the "lonely non-voter" retreat from political life because she feels disconnected from her community? Social scientist Robert Putnam argued something similar in his book Bowling Alone: A strong sense of social connection makes people more likely to vote and participate in their community life. For many, the death of a spouse is the end of the most important social connection they had in adult life, and it's possible that the breakdown of this connection makes people feel untethered from their community overall. If that's at least somewhat true, that public life seems less important when private life collapses, then it's also worth looking at the inverse: Do strong relationships and stable private lives make people better citizens? It's well established that people who are married vote more than those who are not, said the authors, and this study provides evidence that this isn't a coincidence of age or stage of life -- influence from a spouse is part of the reason people vote. As marriage declines, will voter turnout drop? That, however, is a study for another time. This new study isn't without shortcomings. As the authors point out, they didn't include data about a presidential election, and all of their data was based on the Golden State. They only measured voting behavior over the course of a year and half, so even though their results suggested that drop-offs in voting rates persist over time, it's possible that widows and widowers start voting again in the long run. The most surprising methodological choice was how they determined who was a widow or widower. Instead of basing their sample on marriage licenses, as one might expect, they chose from people with the same last name who listed the same address. This was because they couldn't get private marriage data from the Census, they said, and because they wanted to include long-term gay partnerships (complicated in part because gay marriage was illegal in California at the time of the study). What that means is that adult siblings who live together count, but women who keep their last name when they get married don't. According to a 2009 study, many of these women's last names are part of their professional "brand," like business owners, artists, physicians, lawyers, and journalists. It's difficult to tell whether this group would be more or less politically active after their partners' deaths than the general population. Regardless, it's a little surprising that such a big group was left out -- 18 percent of married women in the United States keep their names, estimates suggest. But even for those not be represented in the study, it's a striking argument against the idea that private and public life can or should be considered separate, as philosophers like Hannah Arendt have argued. In this case, one of the most deeply private experiences of a person's life, grieving for the loss of a spouse, can define one of the most public acts a person can undertake: casting a vote.